When MSI released the GS65 last year, it took a risk. Instead of making something massively powerful like the GT75, MSI swapped out its typical red-and-black color scheme and focused on a thin-and-light to create a more portable, but still fast all-rounder. And as a result, the GS65 became the company’s best selling laptop of 2018. But for 2019, MSI is leaning heavily on a refreshingly old school information source to help improve its systems: feedback from users...and feedback in the laptops themselves. That’s because as much as I liked the GS65, I had a few issues with the system’s overall build that made it feel slightly less substantial than you’d like on a $1,800 laptop. So on the GS75— the GS65's new 17-inch sibling—MSI specifically redesigned the new GS75's keyboard deck to have less flex, while also installing new hinges with increased stability, and cutting down the bezels on the GS75's full HD 144Hz G-sync screen. THe GS75's new deck hinges feel noticeably stiffer and sturdier than before. But that’s not all, because based on customer feedback about the GS65's touchpad, MSI upgraded to a new module that features a much nicer glazed coating on top, along with significantly more accurate touch recognition. Then, after all that was done, MSI did its usual spec tuning with components that can go up to an 8th-gen Core i9 CPU, Nvidia RTX 2080 Max-Q GPU, and three SSDs. MSI’s response to feedback isn’t just limited to its gaming machines either. That’s because, for the sort of people who appreciated the company’s blend of specs and design, but aren’t super into the whole gamer aesthetic, MSI created the new PS63. With the PS63, MSI is looking to broaden its lineup to take on big name laptops makers like Dell and HP. Unlike most of its gaming system’s the PS63 sports a fingerprint reader built into its touchpad. And instead of MSI’s Dragon Control Center for managing game performance, the PS63 comes with the Creator Center to help tune productivity apps like Photoshop. 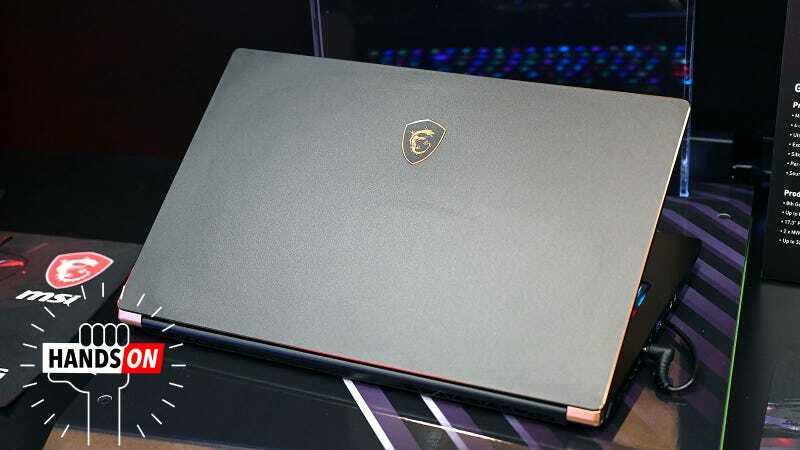 Billed as a machine for content creators, MSI’s new mainstream 15-inch laptop is looking to take down big-name competitors like Dell’s XPS 15. MSI even made sure that at 3.5 pounds and 0.62-inches thick, the PS63 is just a tiny bit thinner and lighter than Dell’s top-selling machine while still packing up an Nvidia 1050 graphics card. Now at this point, some of you may be asking “Don’t all companies listen to feedback?” Well, not exactly. All you have to do is look at Apple to see a company that very rarely responses to granular critique, and instead tries to out think users or possibly look past feedback to see if it’s possible to address a deeper underlying cause. To Apple’s credit, that formula is often successful, though as time goes on, a lot of people might argue that some of Apple’s recent features like butterfly keyboards and Touch Bar are often seen as superfluous extras, or in some cases straight downgrades from their previous iterations. Meanwhile, certain features like the awkward chin-mounted webcams featured on previous XPS 13 models were sore spots for years, with Dell only just now addressing the issue. That’s what makes the relative speed with which MSI made these changes noteworthy. It took less than a year and just one generation for MSI to address the biggest shortcomings on its more popular laptop. On top of that, it also shows that MSI is willing, or at least trying to learn about how best to cater to its customers. And now that MSI is venturing outside of the gaming niche it knows so well and into the world of mainstream computing, the company’s ability to make quick, decisive improvements should be extremely valuable. If MSI truly hopes to compete with the biggest laptop makers, it’s going to have to do both: listen to feedback and anticipate new things people might want. So to help balance the “new feature” side of the equation, MSI is testing out a neat haptic feedback system on the new GE75 Raider that uses a motor installed beneath the left palm rest so you can really feel things like gunshots and explosions. It’s basically the laptop equivalent of controller rumble on consoles, and while I admit it does sound a bit gimmicky, it’s actually a nice way to add some extra spice to FPS titles that I can see expanding to more systems down the road. The new haptic feedback is a feature I can see making its way to a lot more MSI gaming laptops in the future. Elsewhere, while the GS65 isn’t getting any major hardware changes aside from refreshed components, MSI is testing the use of new built-in Alexa controls that let you do things like turn the monitor on or off or adjust the keyboard backlighting using your voice. Voice integration is something I’m slightly less enthusiastic about as it’s sort of a given nowadays, and thankfully, MSI only has plans to test these new features on the GE75 and GS65 for now, as the company is waiting for feedback before bringing these features to other systems. Sadly, no specific pricing or release dates for these systems are available just yet. However, MSI says the GS75, PS63, and GE75 should all be available relatively soon, possibly as early as late winter or early spring.